Kyiv, Ukraine. November 6, 2004. Ukraine  At least 50,000 gathered on Kyiv's central Ploshcha Nezalezhnosti (Independence Square) to protest the Central Election Commission's (CEC) reluctance to finish counting ballots from the 31 October presidential election in Ukraine. The tally on the CEC's website continues to show 97.67% of the votes counted with a marginal lead held by Prime Minister Yanukovych. But returns from the last 2.33% polling stations would make his opponent, former Prime Minister Viktor Yushchenko, the clear front-runner. 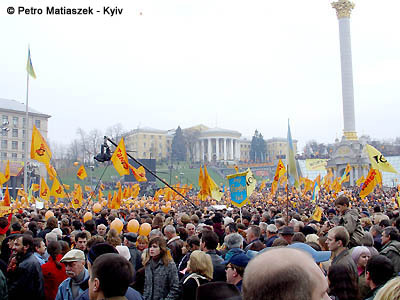 Rallies organized by the Yushchenko campaign were held simultaneously in 11 cities nation-wide. Viktor Yushchenko is considered to be the pro-Western democratic candidate, while his rival Viktor Yanukovych is seen as the pro-Russia oligarchic contender. In Kyiv, Yushchenko was joined on stage by Oleksandr Moroz, head of the Socialist Party who probably finished third in the first round of voting, and by Yulia Tymoshenko, a leading opposition political leader. 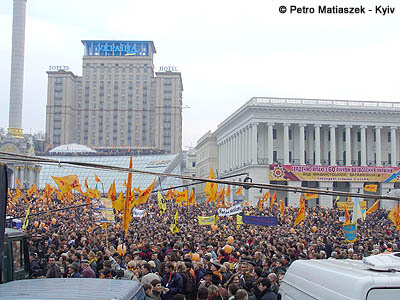 At the rally, Moroz announced that his party is backing Victor Yushchenko in the second round of voting, which are to take place on 21 November. 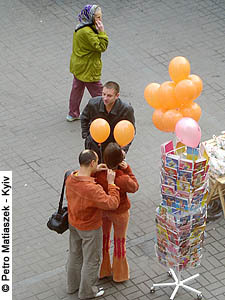 Ukraine's capital continues to be awash in a sea of orange: scarves, balloons, hair ribbons, jackets, etc. Ribbons have appeared on car and taxi antennae, on balconies, trees - everywhere. 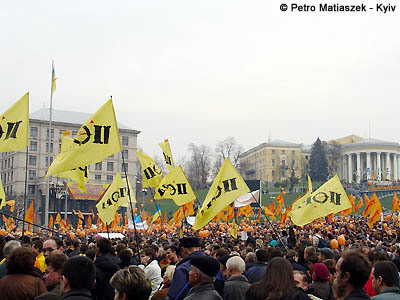 The election is now being called Ukraine's "Orange Revolution", with slogans like "The fall is our time and our color!" The opposition wants the regime to think of Yushchenko every time they see someone eating an orange or drinking a Fanta. 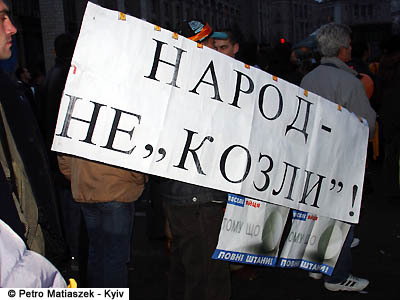 Student activists from the civic group "Pora" ("It's Time!") joined the rally in large numbers. The regime has been especially harsh in repressing the Pora student movement nationwide. Nonetheless, Pora's 10,000+ members continue to stage rallies and anti-regime street theater across the country. This homemade sign proclaims, "The people aren't goats". A couple of weeks ago, prime minister and presidential candidate Victor Yanukovych called on his followers to help him rid society of all "those goats who are keeping us from living the way we want to" - a reference to Ukraine's democratic forces. In Soviet prison slang, a "goat" is a derogatory term for someone who gets in the way. Mr. Yanukovych was jailed twice for assault and battery, but subsequently had his record expunged by the communist party.